An altogether different, and in my opinion far more relaxed performance than any I’ve seen before. The Pirates are always excellent but this was extra special – I’ll come to that in a moment. Dave bought the tickets as a present to celebrate my half-century ( 50th birthday ) and knowing that, due to rail works, there were no main line trains into London we decided to drive to the Stanmore Underground - only to find, on arrival, that that service was out too. The marshals advised going to Wembley – huh, what a joke. We got stuck in the Wembley traffic making its way to the Justin Timberlake ? concert. We ended up driving to Stonebridge Park to get a train. The entire trip, normally 45 minutes took just over 2 hours !! Not a good start. On top of that we had vowed to stayed sober as we both had family commitments the next day. Arriving at the Borderline Dave headed for the bar and I made straight for the Gents, but I didn’t get that far. There sitting at a table en route was Mick and Frank. Mick spotted me at the same time as I saw him and instantly I got the famous Mick Green “ear to ear” smile and a hand shot out. I shook hands with Mick and Frank and launched into telling them about this new Web site. I asked for their approval to solicit your photos and stories and it was eagerly given. Mick even gave me his personal email address which I voluntarily promise not to abuse. Later I spoke to Bernard, their manager, and retold the facts of this new site and he too was very pleased and supportive. We exchanged telephone numbers so I look forward, hopefully, to some input straight from the horse’s mouth. I left the guys to a little privacy and joined Dave at the bar. 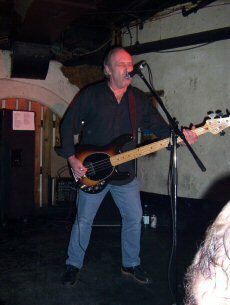 The support band called “Night”, including Mick’s son, Lloyd, on bass, took the stage and went into their set with numbers such as “Real Blood”, “So in Lovers”, “Douse”, “Crystal Superstar”, “Young Believers”, “Firestones” and “Shine Away”. Although not exactly my personal “cup of tea” musically they were tight and they did have presence. Johnny: “ do you know where he sleeps ? Yeah, the language was a little rife at times and I overheard a couple of ladies comment so - but, hey - that's rock'n'roll. One of the little anecdotes concerned “I’ll never get over you” which Mick recounted was written by Gordon Mills who just happened to be “ very brassic” ( short of money) at the time. The hit was so successful that Gordon Mills used the money to back Tom Jones’ career. Mick noted that we had The Pirates to blame for Tom Jones !! Another concerned a disastrous journey they made to Munchen many years ago which led to the writing of "Don't Munchen it" . I always get the impression that they guys are genuinely surprised at their popularity. Mick said as much when he thanked the crowd for always turning up at their gigs. They shouldn't be surprised - its their genuine approach and professional performance which make them this country's finest. It's great to watch them together - there's almost a a telepathy between them in that each one always knows precisely what the others will do.